I am taking a break from the regular MP3 Players Series for a special announcement. The first stable version of Frees has been released. Frees is a GUI tool that shows the Hard Disk space usage. It is written in Python using the GTK2 framework. This will only work in linux as it depends on the ‘df’ command. Frees just parses the output of df and shows it in a graphical format. Frees features a very simple interface. Granted, some of the columns like Device, Type and Mount Point may sound a bit geeky – but hey, you are using Linux. Its supposed to be geeky. There may be some drives that you want to hide in the list. Like, say you have a 10 mb /boot partition – you have no user-level use for that. In Frees you can hide that partition in the list. Go to Preferences > Drives and check off the drive you want to hide. The last item in the list is the ‘Total’ row. It shows the total space of your harddisk. Note that this shows the total of all mounted drives – so it may not be an accurate measure of your total HDD space. KDiskFree displays the available file devices (hard drive partitions, floppy and CD drives, etc.) along with information on their capacity, free space, type and mount point. It also allows you to mount and unmount drives and view them in a file manager. KDiskFree cannot hide drives in the list. KDiskFree includes mounted images, CD ROM/DVD ROM devices as list items. Frees ignores these items. Frees have the ‘Total HDD Space’ feature – KDiskFree does not have that. 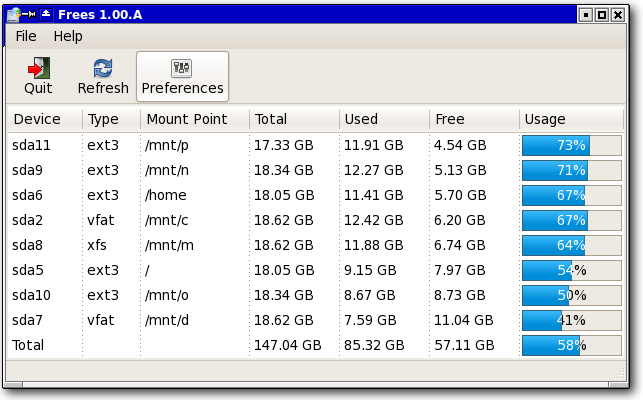 But KDiskFree has one advantage over Frees – you can mount drives from within the application. You cannot do that in Frees. df is not ‘user friendly’ in the classical sense of the term – its a terminal application. Unlike KDiskFree, I do not consider df to be a competition to Frees. As a matter of fact, Frees uses df command internally to get the space usage data. Now, your job is to download this application and try it out. Send me any bugs you find and your suggestions. Frees is a nice program as it is not necessary to install the program. In the preference dialog there is a spelling mistake. Also when I click on the column headers it sorts the list according to the selected column including the “Total” row. I think it is better to place the “Total” at the bottom of the list. I have fixed the spelling mistake and am working on the other suggestion. Thanks for the suggestions. Nice tool. Tried to create a “launcher” in Ubuntu Hardy with no luck. Only runs under “root”, from terminal. Can you fix that? This is a great alternative to the sudo df command.